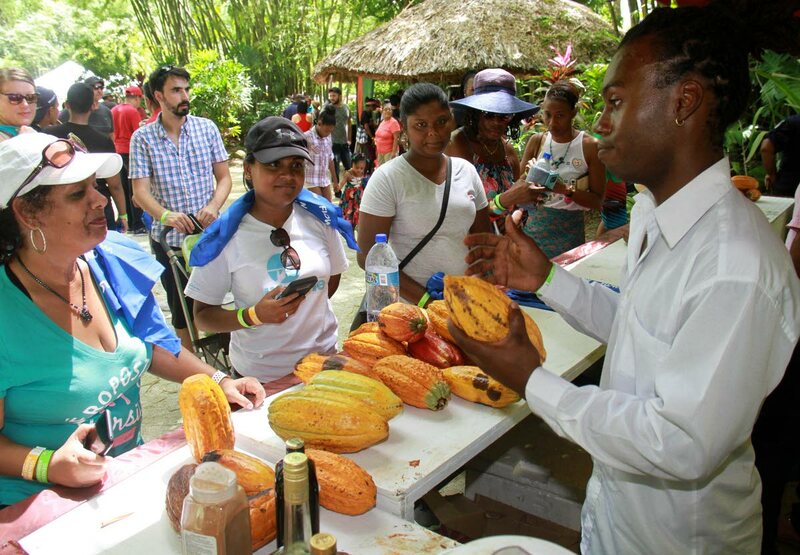 Isidore Vincent of Shandies Bar in Couva shows off his cocoa to patrons earlier this year at the Montserrat Cocoa Farmers Co-operative Society Ltd, Cocoa Food Festival at La Vega Estate in Gran Couva. AFTER decades of stagnation, the cocoa industry is now beginning to re-invent itself and young farmers are breathing new life into the industry. So said Director of the Cocoa Research Centre of the University of the West Indies, Professor Path Umaharan on Wednesday during the first day of a three-day Australia-Caribbean Cocoa Knowledge Sharing Symposium at the auditorium of the School of Education. The symposium will continue until Friday, where Australian cocoa farmers will be sharing their knowledge of farming the crop with Caribbean cocoa farmers in an effort to learn new strategies and share strategies of their own. Umaharan said more people are turning to cocoa farming as they recognise the value of diversifying from the oil industry. “Trinidad was once the largest cocoa producer in the region producing 40,000 tonnes in the 1940’s. Last year we produced 400 tonnes. I think Trinidad has been reliant on oil and gas and by now I think people are realising that we cannot depend on a depleting resource. Umarahan said the Cocoa industry is now getting new energy as young people are now getting into Cocoa farming and chocolate production. He added that since Trinidadian chocolate is being considered one of the best chocolates in the world, farmers are gaining a higher income than they would in previous years. “There are a lot of people making money from chocolate right now and giving cocoa farmers three to four times more than they would get three years ago.” Umarahan said. The symposium was a collaboration between the Australian High Commission and the Cocoa Research Centre, with the objective to bring knowledge that exists in the Pacific, and share with the Caribbean countries. The symposium included presentations on approaches to orchard production, strategies for improving productivity in mixed farms, and strategies for improving productivity in cocoa farms. Reply to "Cocoa industry re-inventing itself"